Google News results now prominently show results from Google Plus (Google+ or just G+). This presents an exciting opportunity for real-time marketers for newsjacking using Google+. When Google+ first emerged in the summer of 2011, it looked to me like a direct competitor to Facebook. Not that the application actually looked like Facebook but that it played in the same market of social sharing and connecting friends. 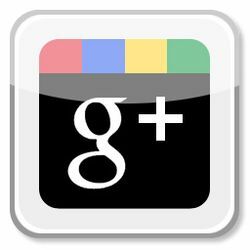 When I first wrote about G+ in my post I really wanted to hate Google Plus that's what my focus was. Initially many people used G+ for business purposes in similar ways that they used other social networks. You first create a personal profile and then figure out if there is a clever way to use G+ for your business. I've noticed a significant trail off in interest in G+ in the past year or so as people who didn't need a "better Facebook" stopped engaging on the G+ social network. That's been my personal experience too. I still post my new blog posts to G+ but I don't go in to see what others are doing nearly as often as I do on Facebook and Twitter. Now there's a way to use G+ for business that has real potential. If you go to Google News, you'll see a dropdown arrow button if you mouse over on the right of each headline. Clicking the arrows reveals more stories and those frequently include a G+ listing. 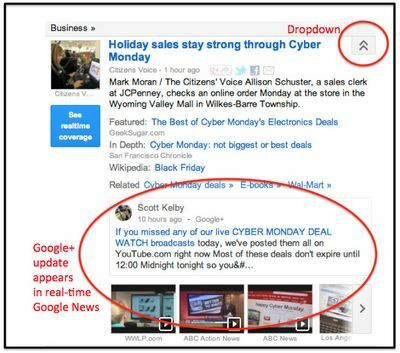 For example, in the business section story this morning talking about "Cyber Monday", the last item (with tons of real-estate) is a G+ update from Scott Kelby. I took a screen shot so you can see how it looked for me this morning. How cool is that? A mere mortal can get into the front page of Google News just by making a real-time G+ update on a breaking news story. Note that I do not know Scott and we are not connected on G+. This has significant potential for marketers who want to inject their ideas into a breaking news story. I’ll be experimenting with this in the coming weeks and months. Meanwhile, do let me know in a comment if you’ve had any newsjacking success with Google Plus.